I am very pleased to part of Wokingham Arts Trail weekend this year. I will be exhibiting my work at InStitches' studio with Hazel Ryder, and we will be sharing the studio with jeweller Dana Kidson and ceramicist Suzanne Needham. Wokingham Arts Trail takes place on Saturday 23rd and Sunday 24th September and all venues will be open from 10:30am to 5:30pm. 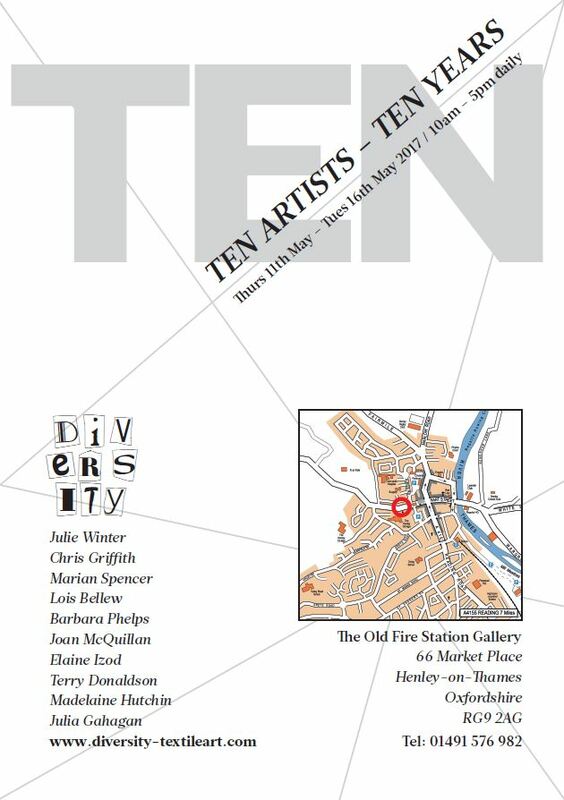 Diversity are holding a retrospective of their ten years together at The Old Fire Station Gallery in Henley-on-Thames this May. although I've only been a member for a year I'm looking forward to being a part of it. 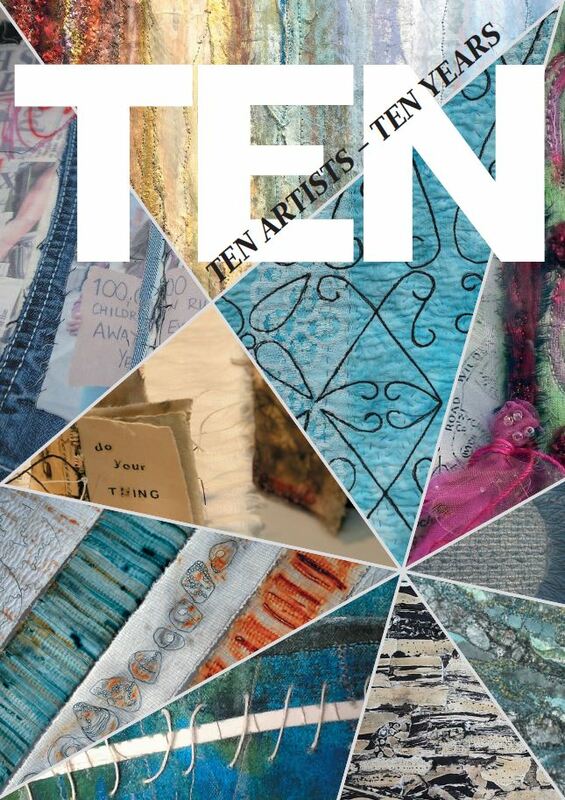 It will be a great opportunity to see a wide range of textile art from over the years, plus some new work. 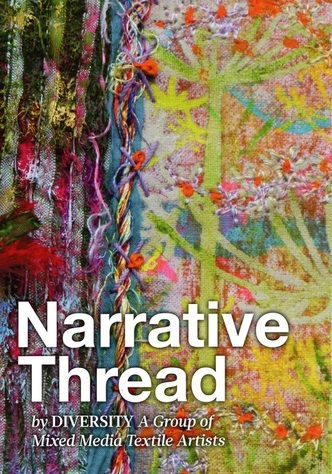 I'm very happy to be exhibiting with Diversity, a group of textile artists working in a variety of media. If you're near Walton-on-Thames do come and meet us . . .
After years of planning InStitches have finally found a studio that we can make our permanent home. This is great news as it means we will be able to teach more dyeing and printing workshops, and invite a wider variety of guest tutors to inspire you. Sunfield Studio is at Sunfield Business Park, New Mill Road, Wokingham, RG40 4QT. All the details are on InStitches website. Click here to see what workshops we have planned. 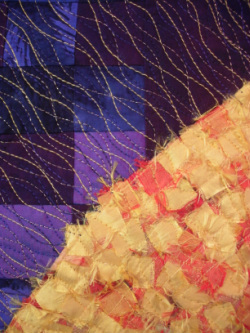 Contemporary Quilt's latest exhibition Elements opened at the Festival of Quilts at the NEC in Brimingham in August 2015. My quilt, Iron, was among those selected to be hung. Made from cotton fabric rusted with found items - mainly old car parts from the landslip on Lyme Regis beach - it has been hand and machine quilted before adding extra definition with fabric paint. Iron is the most abundant element on earth by mass and oxidises readily in earth's atmosphere. It is also essential to life. The quilt is a comment on our attempts to impose order on the natural world - everything will revert to its natural state unless constantly maintained or chemically altered. I have been invited to have a display with Grosvenor Shows in spring 2015. The quilts will be at the Spring Quilt Festival in Exeter from 27th to 29th March, then at Quilts UK in Malvern from 14th to 17th May, and finally at Springfields Quilt Show in Spalding on 5th and 6th June. My quilt, Black Across the Sun, has been selected for Contemporary Quilt's Dislocation exhibition, which opens at the Festival of Quilts 2014 and then travels to Compton Verney and The Bramble Patch. It is one of 44 chosen in what promises to be a diverse interpretation of the theme. In January 2014 I was asked to design a new banner for my local region of the Quilters' Guild, to be displayed at the AGM which they were hosting in Portsmouth. It was a challenge to come up with a simple modern design which represented the four parts of our region - Hampshire, Wiltshire, the Isle of Wight and the Channel Islands. The regional committee suggested many local landmarks and customs which could be incorporated in the design. Eventually these were distilled into a line of silhouettes at the bottom: L-R La Corbiere Lighthouse, Jersey; Fort Grey, Guernsey; Salisbury Cathedral; Stonehenge; Winchester Cathedral; the Spinnaker Tower and The Needles, IoW. Southern Star, the emblem of Region Three, was foundation pieced and appliquéd to the surface, and the lettering was stencilled using Markal Paintsticks through hand-cut freezer paper stencils. Great news! All that Remains II was awarded Best in Show at the Great British Quilt Championships in Sandown in June 2013. It also won the theme category (A Touch of Yellow) and best Art Quilt. Read more on my blog here. Hazel Ryder and I have officially launched our textile courses business, InStitches. For more information on courses from September 2013 visit our website. Come and join us: be inspired! exciting sketchbooks from our first Inspiration to Stitch course. 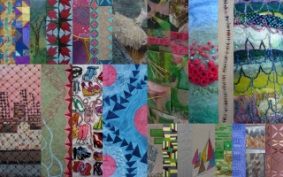 Contemporary Quilt, a special interest group of the QGBI, were ten years old in 2012. To celebrate they are holding a juried exhibition of quilts inspired by a stunning photograph of a tin mine by Tony Howell. The exhibition will premier at the Festival of Quilts in Brimingham, before travelling to other venues in the UK. My quilt, All that Remains (detail right), was one of the 23 selected for the exhibition. A book with details of the exhibition and charting the development of the group for its first ten years is also available - details here. The Stitch Witches held their third exhibition in November 2012 at Alton Assembly Rooms. On display was new individual and group work. 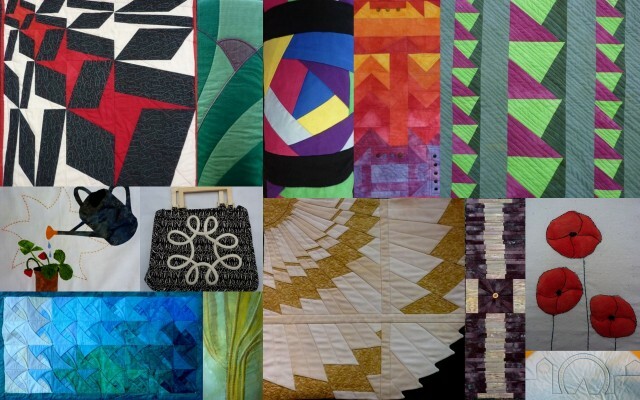 Contemporary Quilt, a special interest group of the QGBI, are ten years old this year. To celebrate they are holding a juried exhibition of quilts inspired by a stunning photograph of a tin mine by Tony Howell. A book with details of the exhibition and charting the development of the group for its first ten years will also be available. Quilts from Region Three of the Quilters' Guild were on display in the Aldwark Gallery throughout August at the Quilt Museum and Gallery in York. These quilts were made for the By the Sea challenge at our April regional day. Entrants were asked to make a wall hanging on the theme of the sea, with dimensions 10" x 60". There were almost thirty entries, representing all aspects of the sea and using a wide variety of techniques. My entry (detail left) was inspired by West Wittering beach, and was awarded first prize. 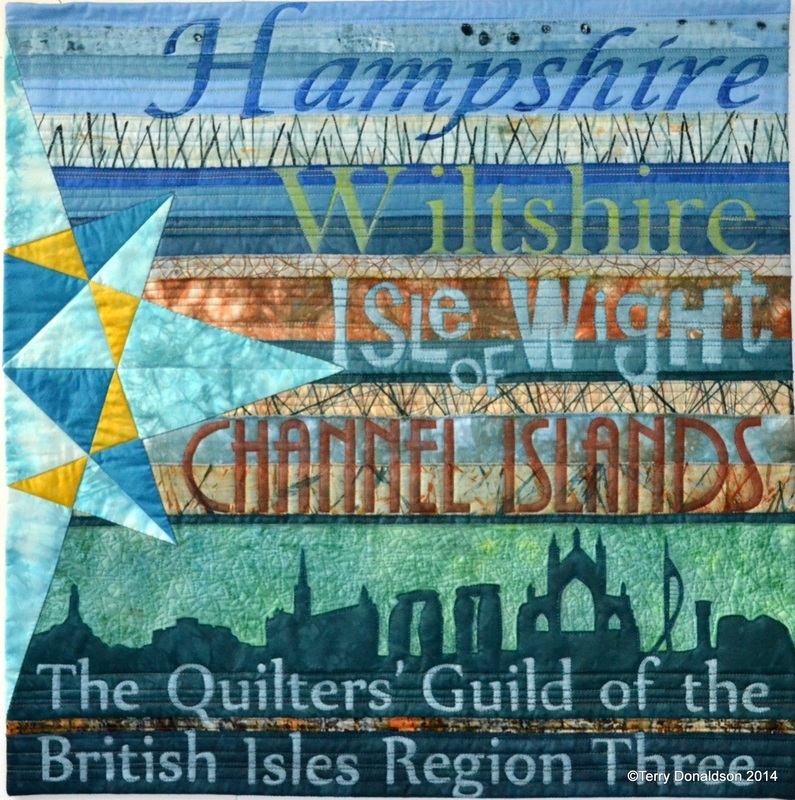 This quote from Liz Whitehouse, Chief Exec of the Quilters' Guild: The regional exhibition in the Aldwark Gallery is Region 3, which in addition to Hampshire and Wiltshire encompasses the Isle of Wight and the Channel Islands, so the sea is really central to their regional identity. The pieces are all absolutely stunning and I know our visitors are really enjoying them as my office is next door to the Aldwark and I can (sometimes) hear the comments! There was a wide range of work on display from the very talented students on our level 3 Certificate and Diploma courses. The exhibition looked stunning and we are very proud of our students' achievements. The staff at Petersfield Library made us very welcome. Photos of the event are here. Come and join us and be inspired! You can see a retrospective of the Stitch Witches' work at the Grosvenor shows this summer and autumn, starting with The National Quilt Championships at Sandown in June. The exhibition will then be travelling to The Great Northern Quilt Show, Harrogate and the Scottish Quilt Championships, Edinburgh in September, followed by the Autumn Quilt Festivals at Malvern and Chilford. An exciting range of work was on display from the very talented students on our level 3 Certificate course. Copyright © Terry Donaldson 2010-2018. All rights reserved.